I am curious about international cuisine, and love to try them whenever I get a chance.There are some dishes that you just can’t go to the local restaurant and try; you have to make it to get a taste of it. Yes I saw this recipe in King Arthur flour blog the first time. When I saw it, I like it very much and planned to make it. But it stayed in my plans for a long time. Finally I got time this weekend I made it, we loved it. Samoa is group of Islands in South Pacific Ocean. It comprises two jurisdictions, the independent country of Samoa in the western half of the islands, and the territory of American Samoa comprising the islands to the east. The two regions are separated by 64 km of ocean. Just like any other food culture, their also includes lot of locally available ingredients like, coconut, breadfruit, taro and other root vegetables, fish, lobster and chicken etc. If you want read more from here . If you are interested know more about Samoan food then this site will be a good choice. I have a weakness to coconut and its derivatives, and love to try whenever I get a chance. Pani Popo (in Samoa, pani means buns and popo means coconut). Buns are baked with coconut milk sauce and the resulting baked buns have a coconut milk dunked bottom side. And it tastes great. I read lot of recipes and watched this you tube video. Basically it is sweet milk buns dunked with coconut milk. I adapted the recipe from My kitchen snippets, also from King Arthur flour site and used both All-purpose flour and bread flour to prevent them from being extra chewy. I used a slightly increased the amount of yeast, water and sugar. Coconut milk sauce was made with equal parts of coconut milk and water and sugar to taste according this recipe. For sweetness I used powdered sugar as I found the recipe of King Arthur flour using cornstarch in the coconut milk. Since powdered sugar/ confectioners’ sugar contains cornstarch, I used 3 tablespoon of powdered sugar for ½ cup of coconut milk. You can increase the amount of sugar if you want a really sugary bun. I baked buns with sweetened coconut sprinkled on the top, even though it is not in traditional recipe. These buns will be good with mixed vegetable stew. 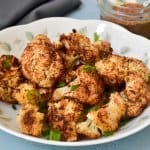 My hubby enjoyed it with spicy pickle. While both me and princess enjoyed it as such. I love it, and I am going to make more often. Try this when get hold of a can of coconut milk or you make fresh coconut milk at home. I found that measuring everything in the kitchen aid stand mixer bowl seems to be easy. 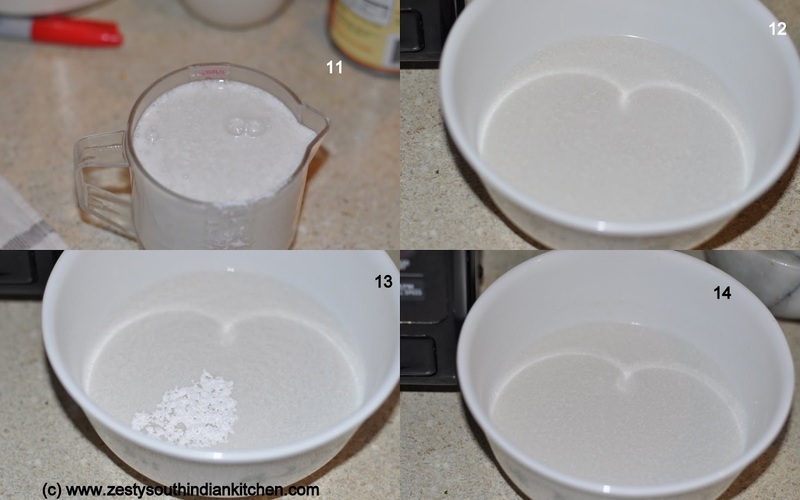 Measure flour, yeast, salt, sugar, then warm the milk and add butter in it so that it will melt easily. Gradually add milk and butter mixture to the flour mixture and form smooth dough. Add water if necessary. Set aside in a slightly greased bowl for first rise. It takes about 90 minutes at room temperature. Once dough doubles in volume punch down, transfer to work bench and cut into 8 equal pieces. Grease a cake tin and set aside. Make balls out each piece by squashing the bottom to form a perfect round and place it in grease cake tin. Set aside for second rise. At end of the rising time pre heat the oven to 350 F. Make coconut milk sauce by mixing equal parts of coconut milk and water and add 3 tablespoon confectioners’ sugar. Slightly warm it in microwave for uniform mixing. When you are ready for baking, pour coconut milk sauce all over the raised buns. Sprinkle the top of buns with sweetened coconut. And bake for about 30 minutes or until golden brown or it register internal temperature of 190F. Serve warm with coconut milk dunked part on top. If you have any left overs for next day slightly warm before serving. Serve extra dose of coconut sauce if you want. If you are using active dry yeast you need to proof the yeast with milk and sugar. I used instant yeast so skipped that part. Heat milk in microwave safe bowl to 30 seconds or it reaches lukewarm temperature. In the warm milk add butter so that it melts and set aside. In bowl of kitchenaid stand mixer add in the 2 cups of flour, yeast, sugar and salt. 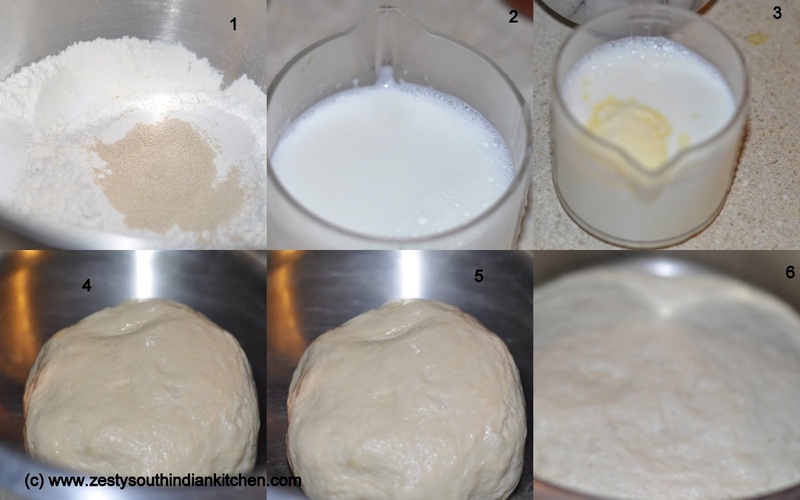 Mix and knead the dough milk and water for form a smooth dough. 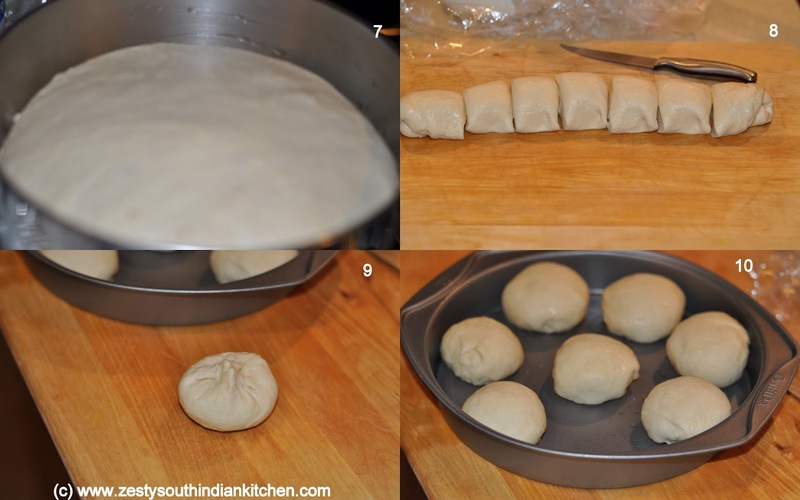 Transfer the dough to lightly greased bowl for double in size, it takes about 90 minutes. Prepare and grease an a round baking pan and set aside. Once the dough is doubled in size remove from bowl and divide it into 8 round balls. Place them in the baking pan, cover and let it rest again until double in size. By the end of second rising, preheat the oven to 350F. 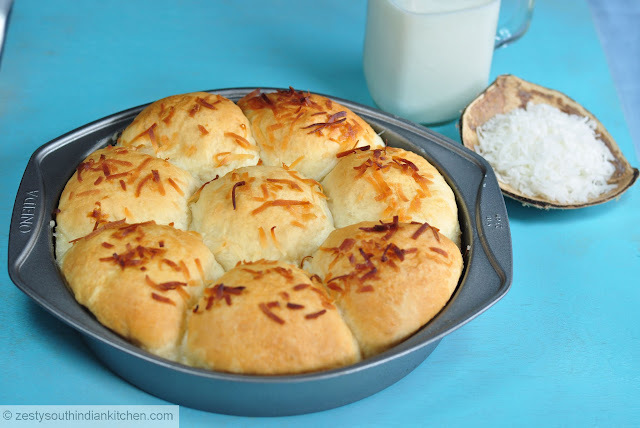 when you are ready to bake, pour the sauce all over the buns and sprinkle the sweetened coconut over the buns and bake for about 30 minutes or they become golden brown color and register the internal temperature of 190 F.
You can add more coconut . looks tempting and mouthwatering swathi. Amazing! Bread with coconut sauce, looks so perfect and surely very delicious dear. Bun looks soft and yummy. very well explained and excellent step by step clicks Swathi! Buns looks delicious. We are very big on coconut in this part of the world too, we love coconut buns! And these look delicious! 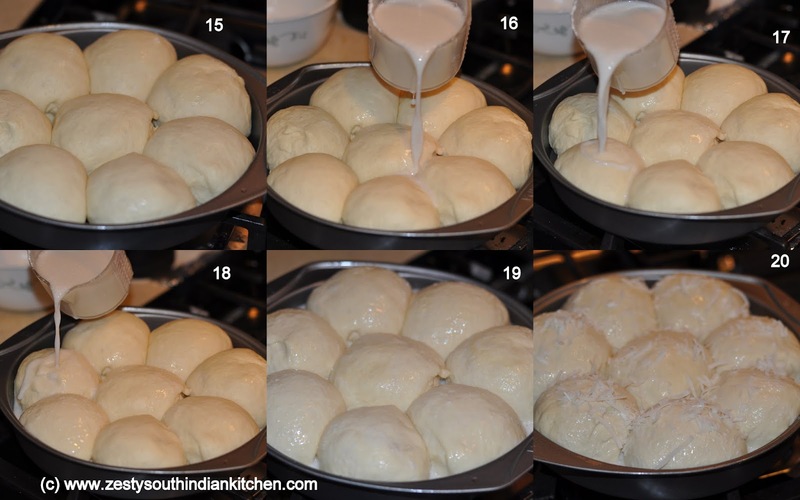 Omg, am gonna make this buns soon,seriously makes me drool. tempting and inviting 🙂 liked all your clicks..
Swathi this is so yummy and looks perfect. I think i can have them all, like you I also have a soft-corner for coconut and love your write-ups, too patient but you do get things to perfection. Nevertheless an amazing baker. They look more ish my friend I would love to try a delicious bun like this! Fabulous and more fabulous. I can’t take my eyes of the pics. You really can bake greatly and these buns are gosh!!! Seem cannot find more words to describe. These rolls look delicious! I LOVE the addition of the sweetened coconut! This is a keeper! What a beautiful and yummy bread! lovely yummy soft buns with an awesome presentation. 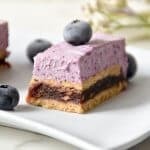 I am going to try this, seriously it is awesome,great recipe. Love the name…Pani Popo…so utterly cute, but mostly delicious. Also love the step-by-step photos instructions, as always! 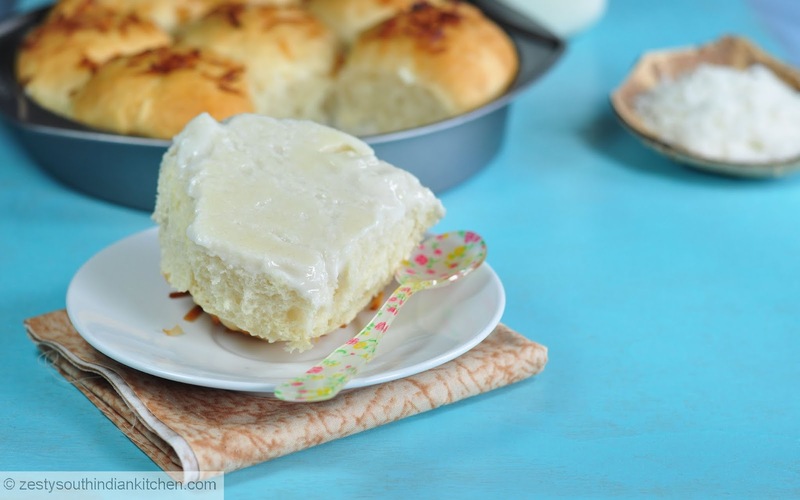 A definite keeper for me to try this yummy soft sweet bread rolls! Oh, mine! this look so delicious, Swathi. 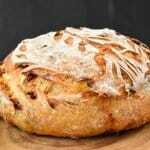 King arthur website is also my go to place to get reliable recipes for yeast breads but never saw this recipe. It must taste so yummy with the coconut. 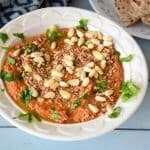 I am taking this recipe with me, thank you for sharing. I am bookmarking this Swathi. Lovely bread. Tempting & mouthwatering. Thanks for sharing step by step pics. wow,fabulous & yummy ..bookmarked,love the coconut flavor!! I am a coconut lover too Swathi! These buns sound incredibly delicious! Putting them on my list of recipes to make. Looks so soft and flavorful!! must be too good..I love coconut too!! Fabulous. Bookmarking for future use. Hi Swathi, today I just dried 1 kg of fresh coconut in the oven. I enjoyed your recipe of these buns. They look delicious. I love your step-by-step pics. They look great with coconut in it. I almost stopped doing yeast baking after going gluten free but I want to slowly catch up again. These buns looks very moist and fragrant. I’m imagining the soaking up of the coconut sauce onto these buns… Yum! Wow cool and unique thing here I found. Looks wonderful and sounds delicious! Awesome Swathi, have to try this out.. I love the sound of these lovely Samoan Coconut buns and they look so tasty too! 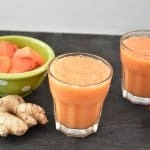 What a lovely recipe; thank you for sharing it, Swathi! At first it looked like honyeycomb buns to me (a family favourite) but on reading further I found it to be a very different recipe. I’m sure it must be delicious. Hi Swathi! It’s been a while 🙂 These coconut buns look so tasty, great for breakfast or a snack. Hope all is well!